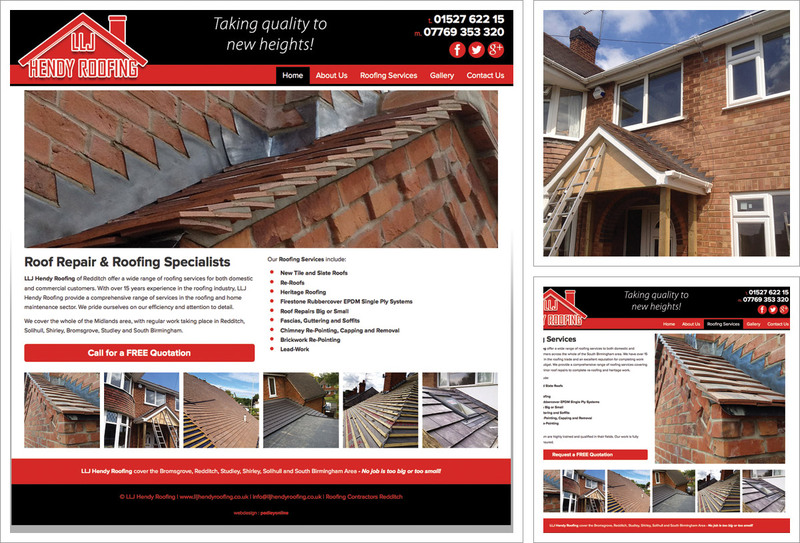 LLJ Hendy Roofing are a local Redditch based roofing company who take quality to new heights and this is reflected by their website. Their large roofing portfolio is demonstrated using a lightbox image gallery which means when selected the image expands on screen and the viewer can scroll ‘previous’ and ‘next’ to see more examples within the gallery. The website includes, Home, About Us, Roofing Services, Gallery and Contact Us which includes a secure online enquiry form. Facebook, Google+ and Twitter are in use and links have been integrated within the site and accompany easily accessible contact info in the website banner. The website is completely expandable and there are opportunities to add more content which will be useful for customers and help with visitor conversion and also great for search engine optimisation. The website has been built using good on-page optimisation techniques for the local and surrounding area and for appropriate keywords and phrases. The branding is striking and distinctive and themes, backgrounds and graphics have all been designed to complement the existing LLJ Hendy logo and colourways. Responsive, changing image banner, contact info on every page. Distinctive branding to complement the existing logo design. Lightbox image gallery. expandable. Facebook, twitter, google plus+. Secure online contact form. Local seo and plenty of scope for development. In preparation for the changes introduced by Google in terms of responsive web design requirements the LLJ Hendy site is a mobile friendly website and will display according to the type of device being used to access it, whether it’s a mobile phone, tablet, laptop or desktop computer.